There is virtually no other car on the market like the 2019 MINI Clubman. With its dynamic appearance, versatility and fuel-efficient and powerful engines, the new 2019 MINI Clubman is the perfect representation of the family car. The new 2019 MINI Clubman offers a spacious interior despite its compact dimensions. There are, for example, 360 liters behind the back seat, enough room for your sports equipment or your groceries for the week. If you lower the seat, you get 1,250 liters which is even more impressive. Under the hood, the 2019 MINI Clubman comes standard with a 1.5-liter turbo three-cylinder engine that develops 134 horsepower and 162 lb-ft of torque. This engine is amazing in the city where its abundant torque results in first-rate performances. That said, we particularly appreciate the average fuel consumption of only 8.5 liters per 100 kilometers. 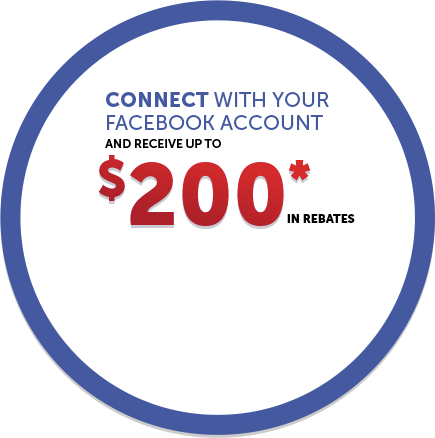 For more power, you can turn to the MINI Clubman S and its 2.0-liter turbo four-cylinder engine developing 189 horsepower and 207 lb-ft of torque. This engine can reach 100 km/h in less than 7.0 seconds while enjoying an average fuel consumption rating of less than 8.0 liters per 100 kilometers. Behind the wheel of the Clubman, you feel like you are in a very small car that has the road behavior of a go kart. The car is agile, and its handling will put a smile on your face every time you drive. 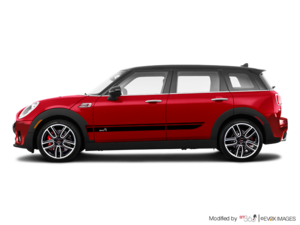 Conversely, the small Clubman has more room than the MINI Cooper with three or five doors and is a more interesting option for young families. 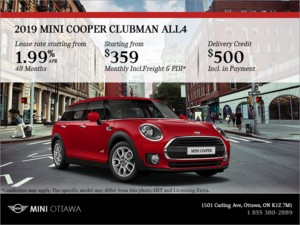 To learn more about the new 2019 MINI Clubman, contact us today at MINI Ottawa!